Use a traditional beaded wooden scoop to add rich flavors from cloves to peppermint. 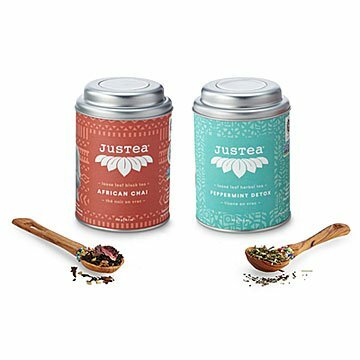 Enjoy tea time on the Savannah with a cup of this sophisticated African chai or peppermint tea. Non-GMO and pesticide-free, it's grown on a small-scale farm in Kenya known as a "shamba" using ethical and sustainable farming practices like paying farmers fair wages. The loose leaf chai features cloves, fennel, cinnamon, and rose petals, and the peppermint carries notes of lemongrass to form a sweet blend that can be re-steeped several times for lasting flavor. Scoop the fragrant leaves from the canister with the included hand-carved wooden spoon, which sparkles with a band of colorful glass beads. Handmade in Kenya. Click here to learn more about the tea farmers. Spoon is for dry use only, keep out of reach of children. Do not put in dishwasher. Steeping Instructions: steep one teaspoon of tea at 205°F for 3 to 4 mins. Each tin makes 40 cups of tea. Re-steep this whole leaf tea for 80 cups. This was part of a gift basket I was putting together. Since the picture shows two cans of tea, that's what I thought I was paying for. The description does not say otherwise, and there is no option to choose which type of tea you want, further leading one to believe that two cans of tea would be included. I had just happened to be going to Kenya and sent this as a gift to my mother while I was there. It was perfect and she loved the wooden spoon!